Charge your Mac (MacBook Air 13 inch or MacBook 11 inch), new MacBook 12 or other Tablets or smartphones on the go. Faster and safer charging with our advanced technology, all products have passed CE FCC and ROHS certifications! Lizone QC Technology: Detects your device to deliver its fastest possible charge speed up to 4 amps with the DC Port and up to 3 amps per USB port or 6 amps through four ports. High Capacity: Charges the Macbook Air approach 1.5 times, iPad Mini 1 approach 4.0 times; iPhone 10 times and Samsung Galaxy S6 approach 8 times, Safely recharges with a 2 amp or higher output charger (please note most phone chargers only have 1 amp). Incredibly Compact: 7.3 × 3.3 × 0.8 inch, 22oz it fits perfectly in your pocket. 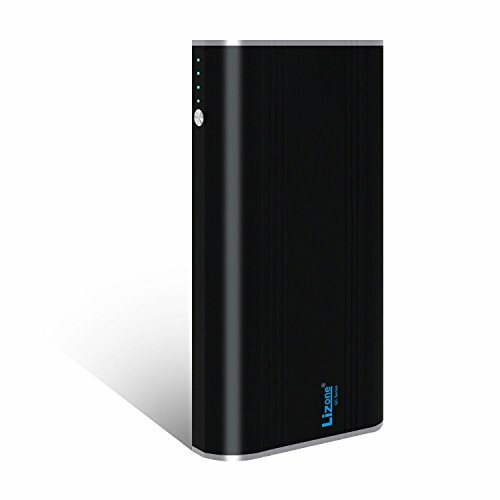 Recharges in around 3-4 hours with the Lizone Slim 90W adapter (included), around 10 hours with a 1-2A adapter (not included) and the included Micro USB cable. Maximum Compatible: Macbook Air 11 and 13 inch (included Magsafe2 Magsafe1 Charging Cable) New MacBook 12 (included USB to Type-C Cable); Apple and Android smartphones(All), tablets(All) and other USB-charged devices. Package Contents : Lizone 35000Ah QC Portable Charger External Battery Power Bank for Mac, Ac Charger, Magsafe2 and Magsafe1 Charging Cable for Macbook Air, USB to Type-C Cable, Instruction Manual.